I don’t know quite how much of this fabric I bought but there has been yards of it, especially as it is 60″ wide. 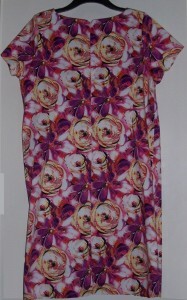 I have already made two dresses and now here is the final garment – yet another “Loralie” Blouse. I have a pair of Lilac cropped trousers and as I notice there is some Lilac colour in the bold print decided to make a co-ordinating blouse. The fabric is a real dream to cut and sew. In just over 3 hours I completed the blouse. 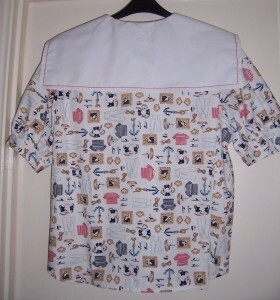 I have top-stitched the curved, shaped shawl collar, sleeve hems and the shaped hem.The blouse is sewn entirely with White thread and all seams are overlocked with 3-thread overlocking stitch. The deep Lilac/Purple buttons came from my stash. 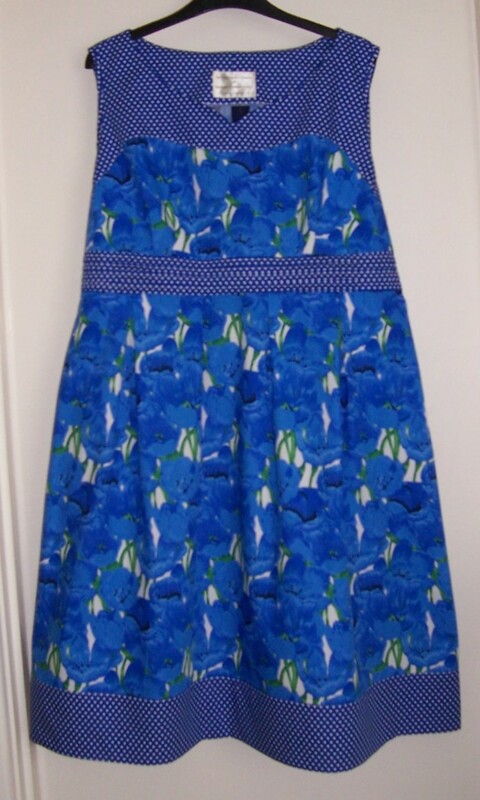 I have had this pattern in my stash for ages and in the hope that we will eventually get some Summer sunshine I decided that now was the time to make a Sundress. Having prepared the fabrics – both 100% cotton prints from Fabricland in Salisbury, I bottled out of making view C as I felt I would be just too exposed! I decided instead to make view A but with some variations inspired by View C. I particularly liked the contrast spot print around the bodice, midriff band and hem so wanted to include these features in my dress. I altered the bodice pattern for my unique (!) body measurements and drafted for contrast sections on the bodice. View A includes a side seam zip fastener which I dislike and I therefore allowed for insertion of the zip into the centre back seam – my preferred location. I finished the zip with a hand-picked seam but when trying on discovered that the dress goes on “pullover” style so the zip is not needed. 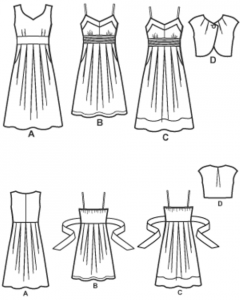 The pattern also calls for the bodice to be lined. 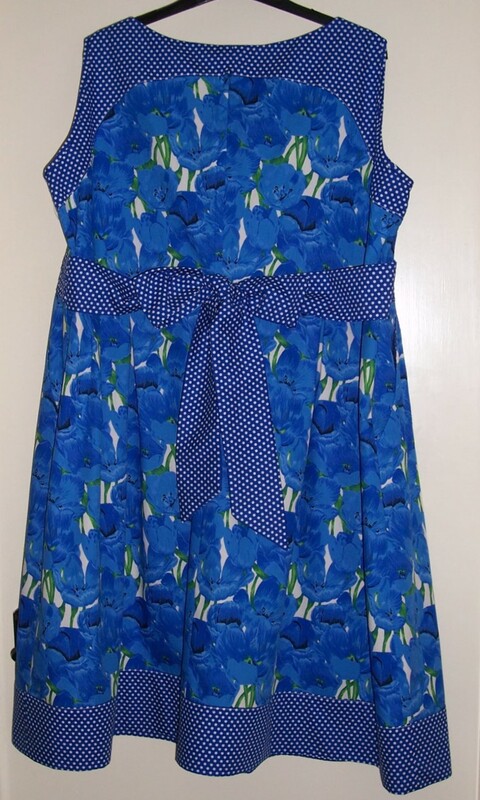 As this was to be a Summer dress and I wanted it to be as light as possible I drafted facings for the neckline instead and decided to bind the armholes with self bias binding. I had sufficient contrast fabric to cut the sash so included this in my cutting layout to be set aside and checked when I came to the fitting stage as to whether or not it was required. All went swimmingly well until I started to sew the tucks in the midriff band. On the illustrations you can see 5 pleats and they look to be quite deep. 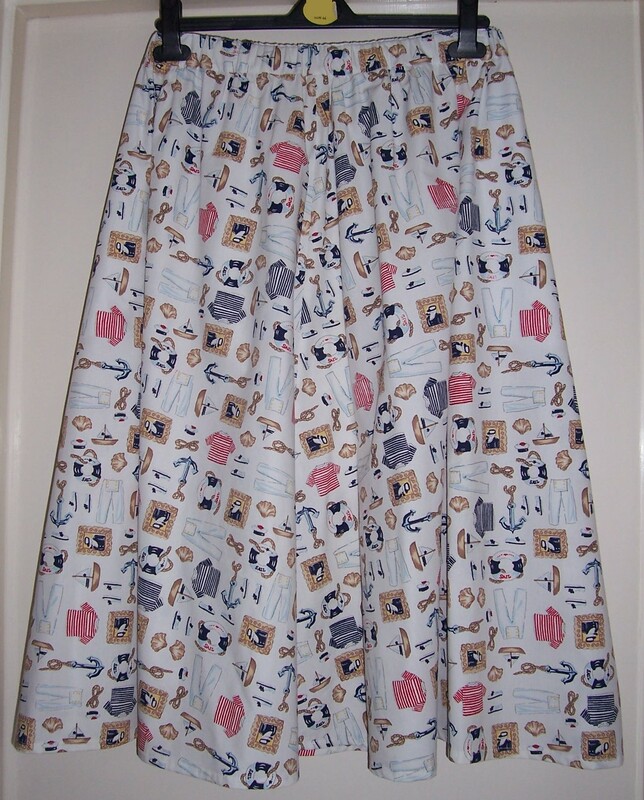 The pattern identifies the tucks, on close inspection they turned out to be pin tucks not pleats at all. I changed to just 4 deep pleats and the finished midriff band ended up the correct depth to line up with the back bodice. At fitting stage I noted some “gaposis” in the armholes and this has necessitated a tuck of approximately 1/2″. The line of the armscye has changed but as it is bias bound is of no consequence. I have altered the bodice pattern and corrected the armhole line – just in case I decide to make this design again. I particularly like the sweetheart neckline and deep pockets which are stitched into the side seam and midriff band seam which means they don’t flap about inside the skirt. 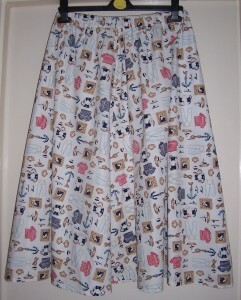 This time I made the skirt with the box pleats as per the pattern. 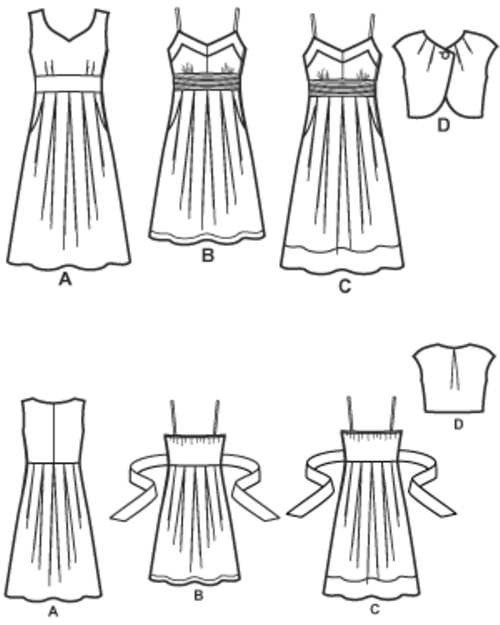 I think another time I would make a gathered skirt and also replace the tucks in the bodice for gathers. 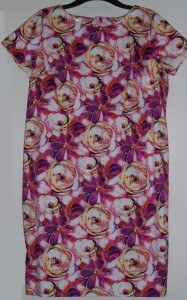 Using the “end of roll” bold-floral-printed stretch cotton purchased from Sew Simple in Taverham, Norfolk, I have made up the Prima shift dress for the 46th (!) time. 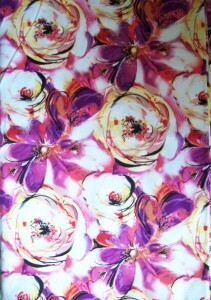 As I knew the fabric length was only just over 2 metres and allowing for print placement (those huge roses!) I would be short of fabric I did not think there would be enough for sleeves. Luck was on my side, there was sufficient for some short (almost cap) sleeves which I prefer to sleeveless for this particular style of dress. The fabric was a dream to cut out and stitch. I am particularly pleased to see that I managed to centre up the design on the front of the dress (the back is not quite so good but at least the roses do not fall on my cheeks!) 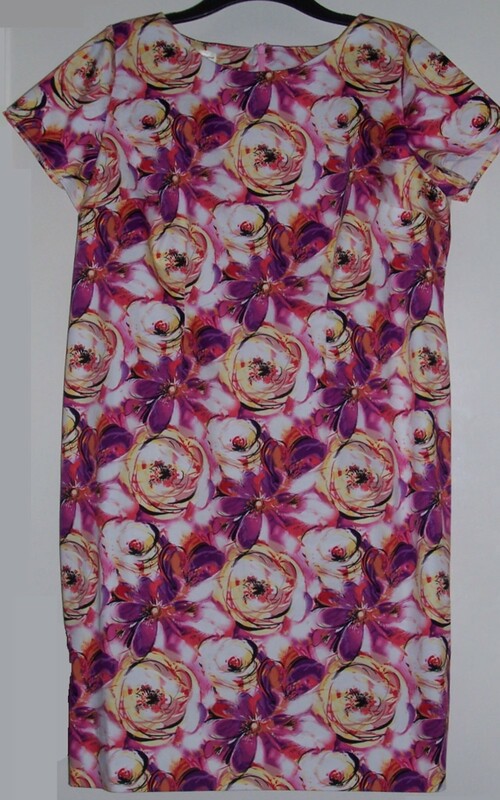 It was not until I checked in the full-length mirror that I also noticed the distinct diagonal pattern in purple that is created by the darker floral print. The only problem with this garment was my lack of experience with invisible zips. This one was set too high in the seam so that the turnings on the facings are lumpy and there is no space for a hook and eye fastening. Still the lumps and bumps will be hidden by my hair and this dress will serve as an excellent reminder for when I next stitch an invisible zip – note to self – set the zip about 1″ below the cut edge of the neckline to ensure sufficient space for seam allowances on the facing, turning and the fastening . 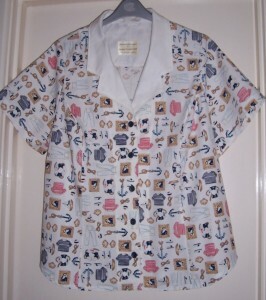 A good day with few interruptions means that the second Nautical-themed blouse is now completed. 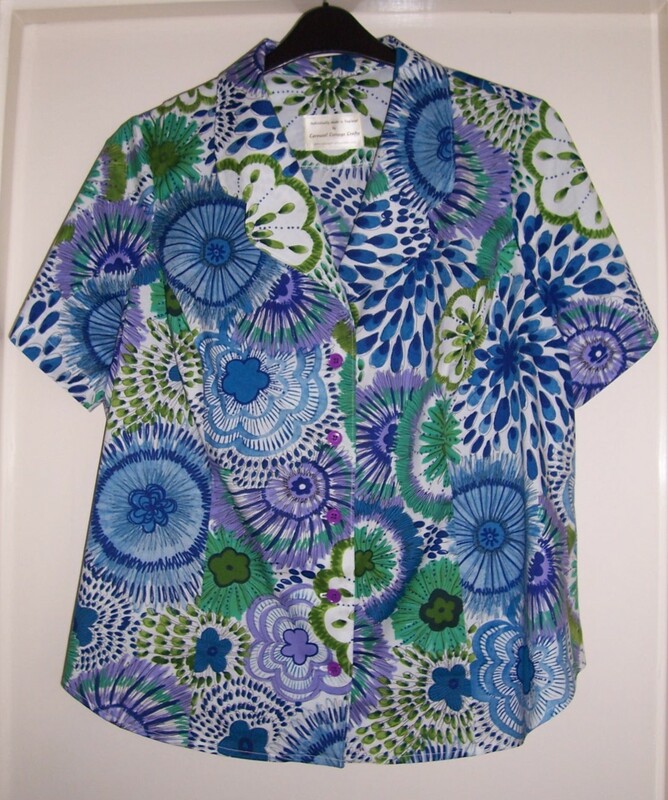 I used McCalls 2797 for the princess seamed bodice and shaped hemline, but added a shawl collar from McCalls 6438 and my own drafted short sleeves (referred to as a “Loralie” blouse). This time around I have made the rever shaping into points as I thought it would be more appropriate than the rounded version. I top-stitched the collar and have also top-stitched the facings into place. 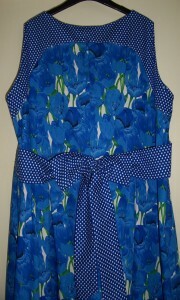 Buttonholes are again stitched in White to blend in with the print and the buttons are in Nautical Blue. I have very little of the fabric left, maybe just sufficient to make a toilet bag. As I purchased this fabric such a long time ago it feels as though this outfit has cost me nothing except my time, what I call a “Result”! 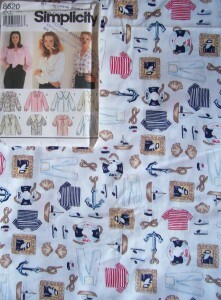 After several interruptions to my sewing I have now completed the “sailing” outfit. I decided to make the dress in two parts so that I can wear each piece separately with other co-ordinates from my wardrobe. I made the 4-gore circular skirt using the skirt section of McCalls 6438. 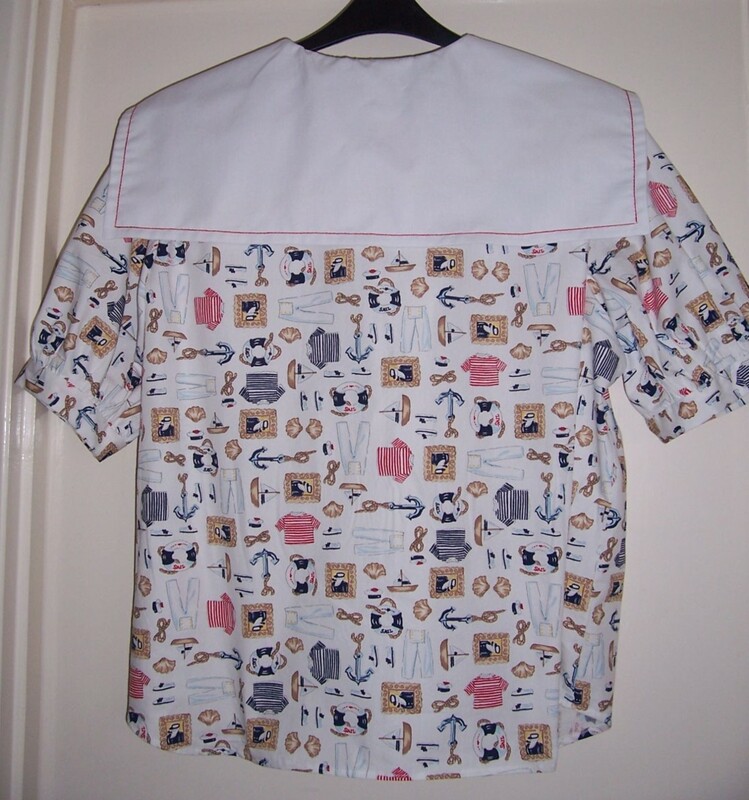 I used a plain white cotton for the in-seam pockets to avoid any show-through of the print on the fabric and made a separate elasticated waistband. 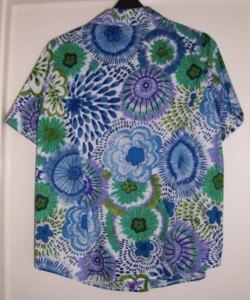 As the fabric was 60″ wide I have sufficient fabric to make two co-ordinating blouses. 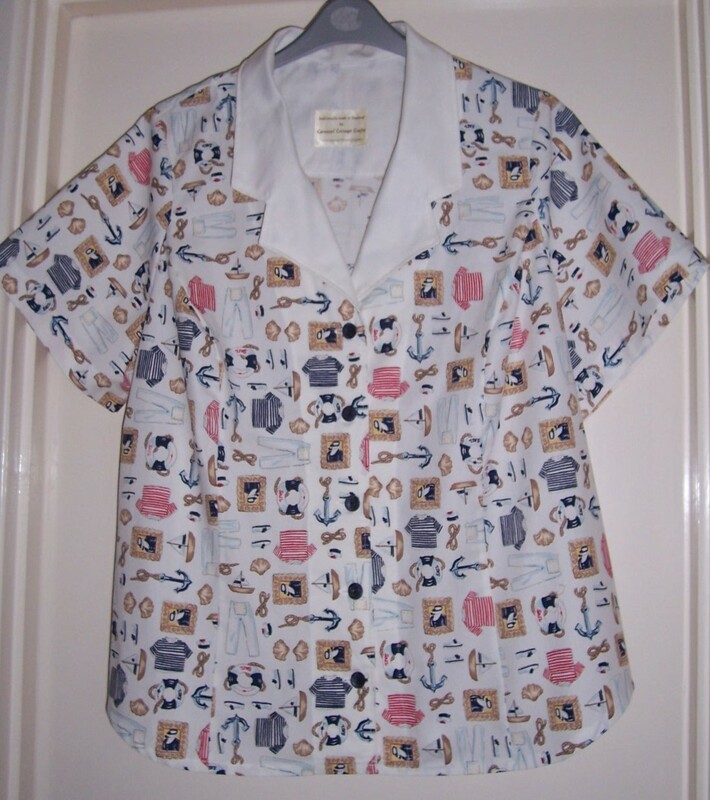 The first is the sailor-collared version from Simplicity 8620 and the second (yet to be completed) will be my version of the princess-seamed McCalls 2797 with the added shawl collar from McCalls 6438 known in my sewing room as a “Loralie” blouse as I first made this adaptation using Loralie printed fabric. 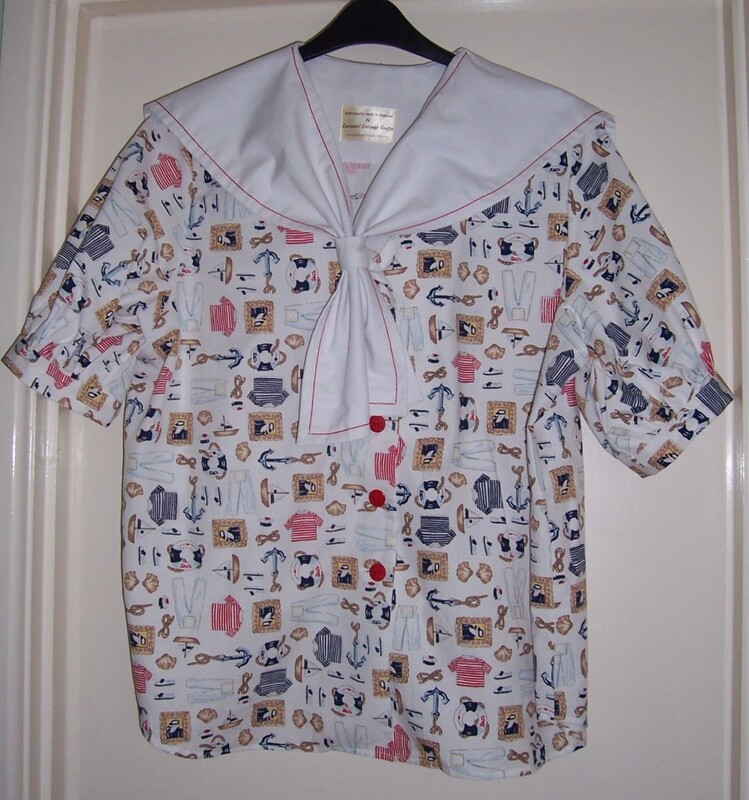 The sailor-collar blouse has turned out well. 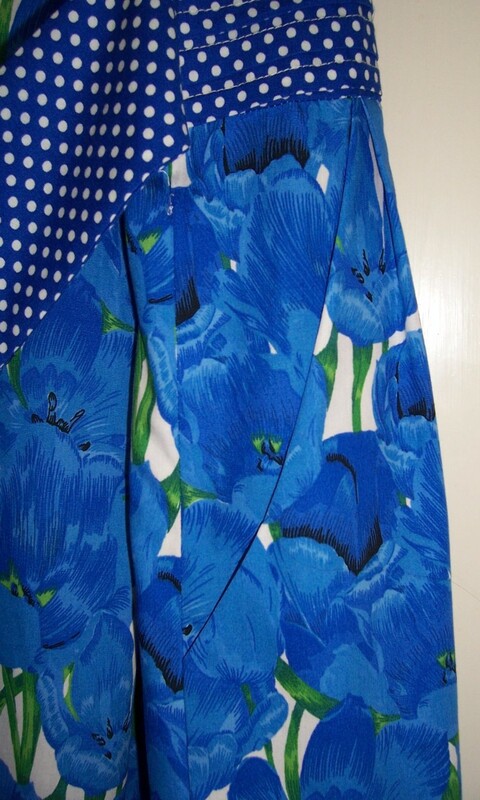 I added to the length and gave a shirt-tail shaped hemline so that I can wear the blouse over Blue, Red or White cut-off trousers. 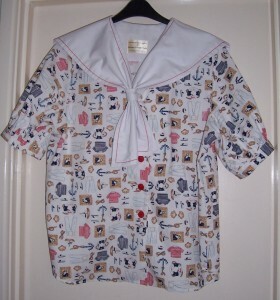 The collar has been top stitched with a triple stitch in Red thread and the buttons are also Red. When worn with the skirt I shall finish the outfit with a wide elasticated belt also in Red (as shown in the Jubilee Cherries dress). Now I just need to sort out some shoes to complete the ensemble! My friends know that I do not enjoy alterations and avoid them at all costs. However, when it comes to adding a little something extra to a standard tee then I am happy to settle down for half an hour and see what I can produce. 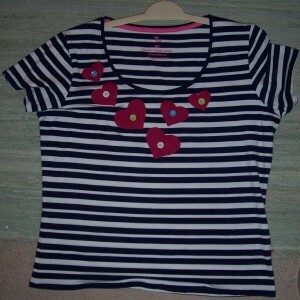 This alteration started with a Navy & White striped tee from Sainsbury’s. When I tried it on it was far too long so a quick whizz around the hem with the overlocker and then a double row of straight stitching soon sorted that out! What to do next? I recently purchased a Hearts die for my Sissix Big Shot and decided to cut a few shapes. I pressed Heat ‘n Bond to the reverse of a scrap of dark Cerise Pink cotton and cut the hearts which are in 3 different sizes. They were applied to the tee using a machine “blanket” stitch. Having rooted through my stash of buttons I came across some fabric buttons which were previously around the neckline of a top. 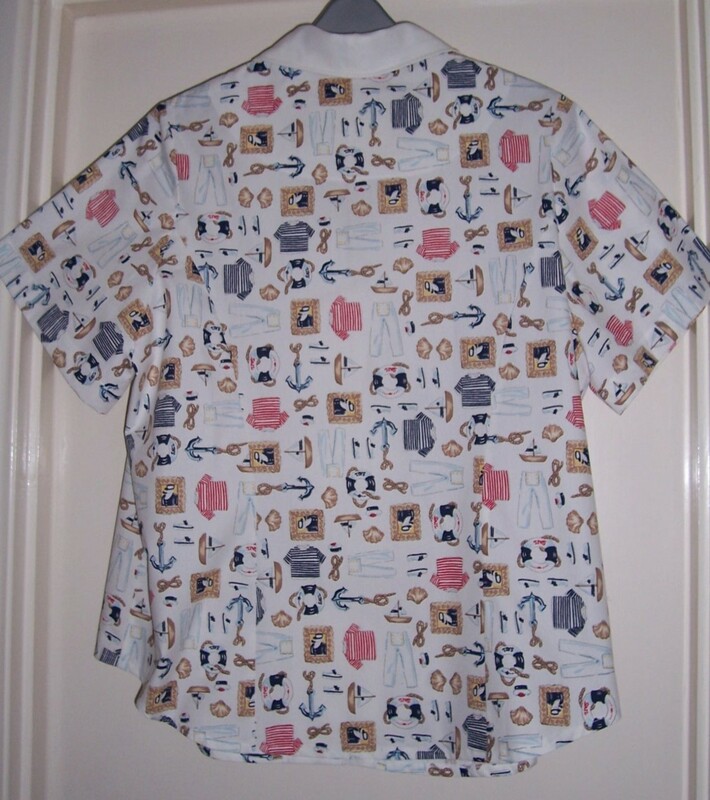 I thought those will do….. here is the finished tee. I am very pleased with the result, an ordinary tee shirt promoted to the extraordinary! As many of you know, I plan to be sailing away on a cruise to the Canary Islands later this month. In anticipation of the adventure I plan to make a complementary blouse featuring a “sailing” theme printed cotton in a sailor-style. 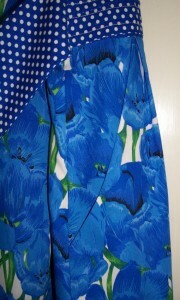 I have had this fabric for “donkey’s ears” (sic donkeys’ years) where it has been kept in the dark in the loft. As the fabric is pure cotton I plan to measure the yardage that I need, overlock the raw edges and pop through a gentle wash to ensure no further shrinkage once the blouse is made up! 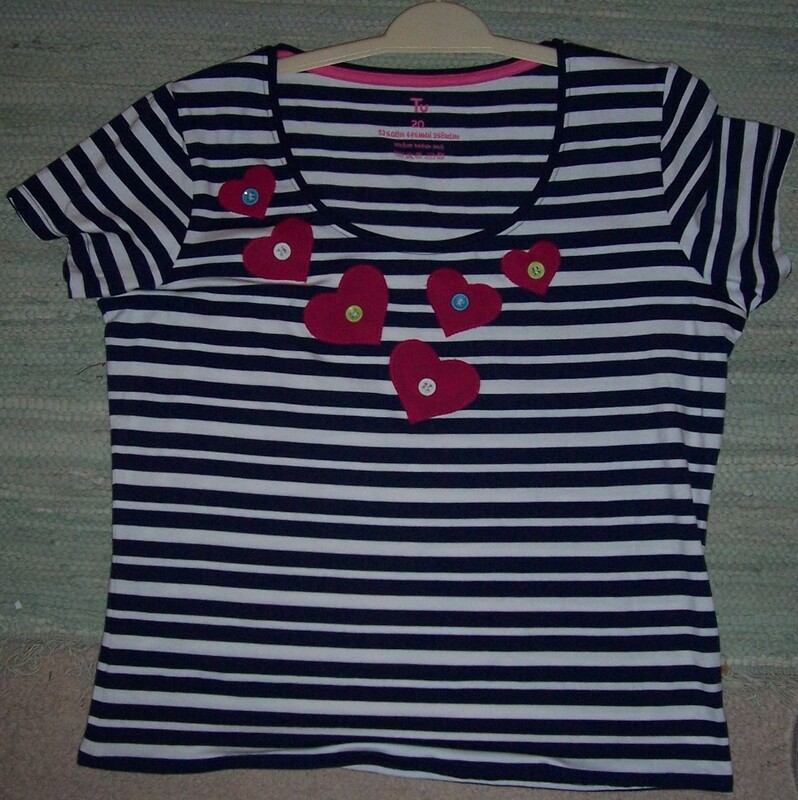 The second shopping outing was to my old favourites – Sew Simple in Taverham. 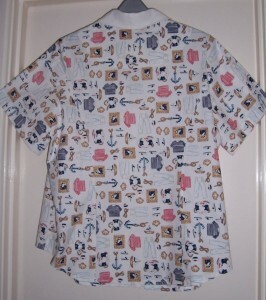 http://www.sewsimpleonline.co.uk/shop/. I have visited before so knew what to expect. 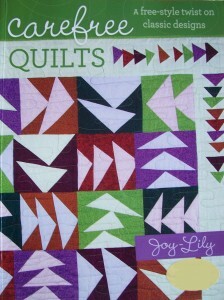 A veritable feast for anyone interested in sewing, knitting, crafting! Firstly I browsed around a book store which is in another part of the complex and was delighted to find “Carefree Quilts” book at a very competitive price! 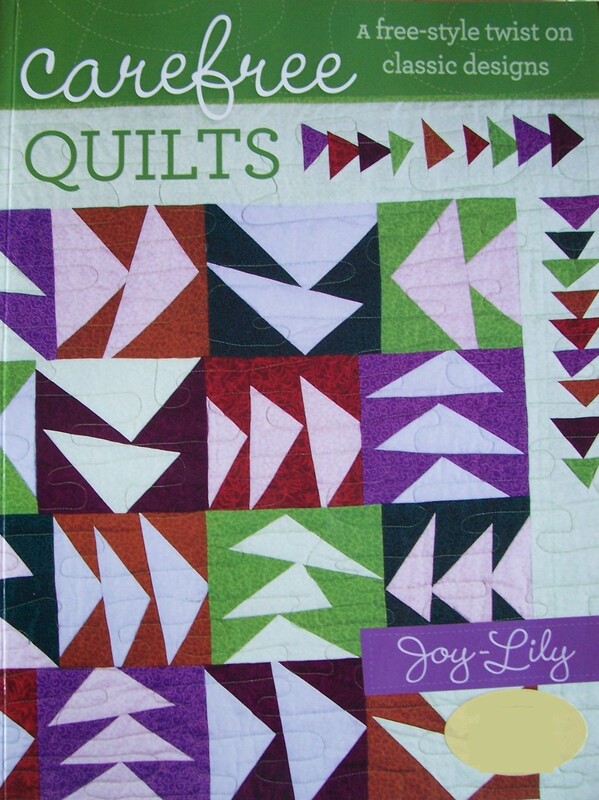 The book is filled with inspirational ideas for quick and easy quilting using traditional block designs – but with a more carefree, relaxed attitude to accuracy. I shall certainly be exploring some of the projects in the book. After a restorative coffee and cake I strolled around the large sewing area, checking out all the fabrics, magazines, project ideas before finally making my selection. I bought the last of a roll of stretch cotton fabric with a very BOLD floral pattern with which I plan to make into a sleeveless shift dress. I will use that “old faithful” Prima dress pattern so once completed the dress will be known as no.46! I’m back from a week’s visit to relatives in the lovely county of Norfolk in East Anglia. Whilst away I took the opportunity to visit a couple of fabric stores. The first visit was to Shan’s Fabrics in Hunstanton, http://www.shansfabrics.co.uk/. It took a short walk from the car park to find this Aladdin’s cave which was filled with a wide range of fabrics. So many to chose from but I was limited in my choice as unfortunately this shop does not take credit cards or cheques. As I had only £30 in my purse I had to make a decision about which fabric to buy. 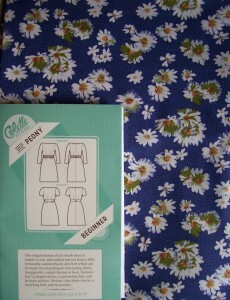 I settled on a pretty daisy print on Blue background “Rue de Fleur” for Fine Lines Fabrics. When I returned home I found a new “Indie” pattern, Peony by Colette had arrived in the post which I think will look great made up in this fabric. 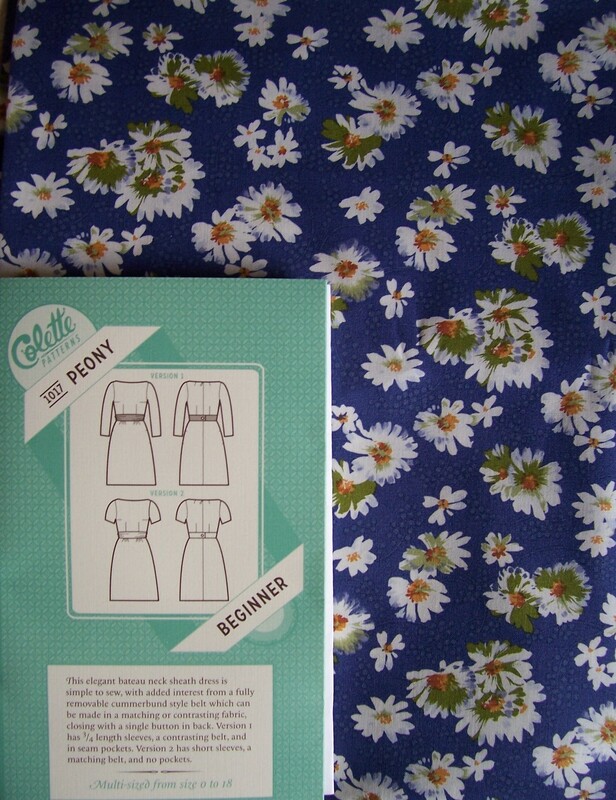 I have never made up a Colette pattern before and am looking forward to this new experience. 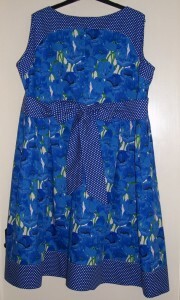 https://www.colettepatterns.com/sewing/peony.